I have certain reading rituals; I think everyone does. Some of them are comfort related, some are food related, and some are not easily categorized. One of my rituals when reading a large hardbound volume is to sit with a pillow on my lap and the book opened on top of the pillow. 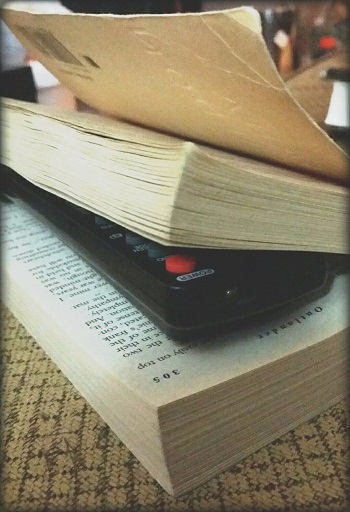 This allows me to be hands-free while reading for any length of time. Really, it saves me later hand cramps from holding such a large tome. My cat, Spirit, is in the habit of curling up on my lap while I’m vegging on the couch or my recliner. He doesn’t appreciate his prime sleeping spot being taken over by a book. What is a cat to do? 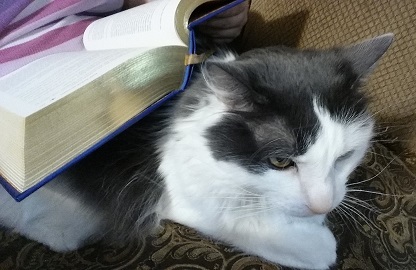 Spirit has handily solved the problem by lying right on top of the open book on my lap. 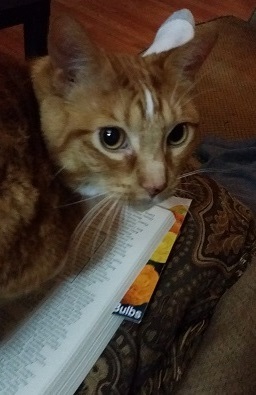 He loves lying on my open books. Plus, there’s the added bonus (for him anyway) of me being unable to read, and he’s in prime petting position. Thus, I end up petting him and ineffectually trying to push him off my book. That cat can make himself weigh 50 lbs if he wants, I swear! I am usually incapable of gently nudging him from atop my book. I usually end up telling him he doesn’t make a good window, and that I’m trying to read this book. 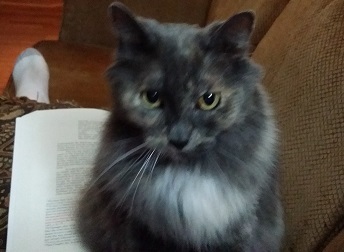 I believe my exact words are, “I’m trying to read dis book, meowface.” Like reasoning with a cat is going to do me any good. *shakes head* The situation generally devolves into me crooning insults at the cat in a lovey voice, with him none the wiser of what I actually want. He’s cute, and thus usually wins. Well, he wins for a minute or two. Eventually I get tired of this game and tilt the book so that he falls off. He usually only slumps off onto the pillow and stays exactly as puddled thinking it’s a new great resting spot. I’m left to rest the book on top of the cat, rather than the pillow. This is my winning move. Spirit doesn’t like being a bookrest, and he generally leaves with a sigh or a snort. Victory! Silly meowface. The sweet victory is often only a passing reprieve between cats. Psyche or Sativa will eventually get the memo that I’m reading a book on my lap. They’ll find me and repeat the entire process. What is it about lying on an open book that is so appealing to a cat? I bet it’s like boxes. They like the feel of paper under them. Who knows? Catses are funny creatures. 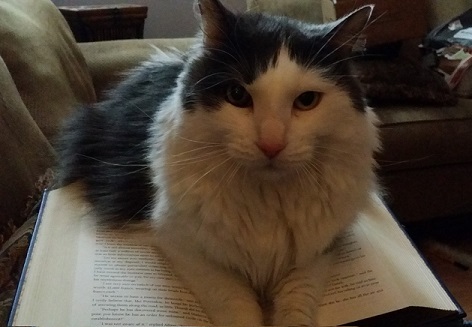 How do your cats lovingly annoy you while you read? I have a bookmark entitled 50 Books to Read Before You Die. It’s a lovely thing. It’s the perfect bookmark size and shape. It’s made of metal and has substantial weight, but not too heavy. In short, I like it. I am, however, a little baffled by the book selections. Who came up with this list? Why these titles and not others? I’ve long since thrown away the wrapping, and don’t remember the manufacturer. I’ll give you the titles in a moment. I suppose I’d like to know why I should read these particular books before I die. Are these books meant to make me a well-rounded person? Meant to inspire? Just written well? Maybe these books, when taken as a complete list, are reflective of the quintessential human experience. 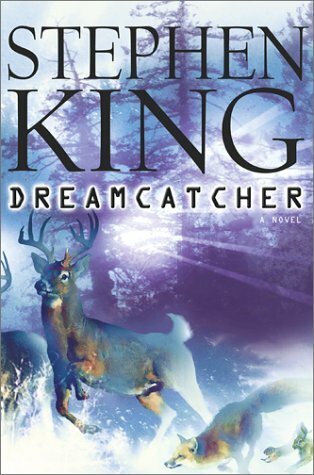 And, then again, maybe I’m reading way too much into it, and it’s just a list of well-liked books. As you can see, I’ve only read 19 of the above 50. I have some reading to do! My own list would undoubtedly have different titles, and would most likely sample heavily from specific (favorite) genres. I like to think I’m fairly well read, but I have my preferences. Don’t we all? I’ll have to muse a bit on which works to include… This may be a later post. So, how many of these have you read? Answer below in the comments.